we cover with the expertise from our departments. Thus we have everything under control and provide ionization systems to meet your needs. is systematically developed into a high quality HAUG product by applied research. A good idea ... and a few lines are always the beginning. ensures reliable operation of the HAUG ionizing systems. 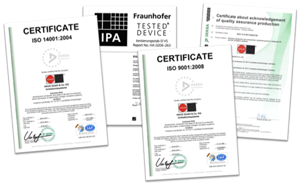 guarantees high precision and quality of the HAUG products. please contact the sales department at our headquarters or from our many partners around the globe. repair or maintenance is done by our own service engineers in the headquater. HAUG produces ionizing systems. These are tools for eliminating and producing electrostatic charges. Discharging systems are intended to eliminate electrostatic charges and for the contactless cleaning electrostatic particles on foils, glas, paper, carton, textiles and many others. Charging systems serve the electrostatic fixation, i. e. for sticking together the object by use of electrostatic charge. For example labels are fixed by charging technique in moulding forms (IML-process). more trade fairs can be found here. The Ion Beam DC compact is a fully integrated ionization system that requires neither a separate high voltage power supply nor a high voltage cable. It works on the highly efficient DC voltage principle and can be connected to a machine control.